Symmetry drawing is the perfect way to use art to introduce math and geometry to elementary grades! Easter Symmetry Drawings can be used to teach elementary students about symmetrical and asymmetrical shapes and objects in a fun and easy to explain way. 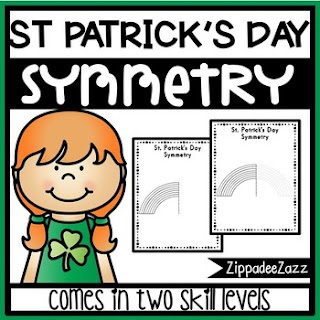 By using Easter symmetry drawings, your students will be more likely to understand and explain symmetry and lines of symmetry. Symmetry drawings are a great way to add art into any unit and create unique and colorful bulletin boards! • High quality PDF format. COMMON CORE STANDARDS: K.G.A.1, K.G.A.2, K.G.B.4, K.G.B.5, 1.G.A.1, 2.G.A.1. This is a single license use - only for YOUR classroom, please do NOT distribute or share this product unless you've purchased an additional license. © 2017 by Zippadee Zazz. All Rights Reserved.